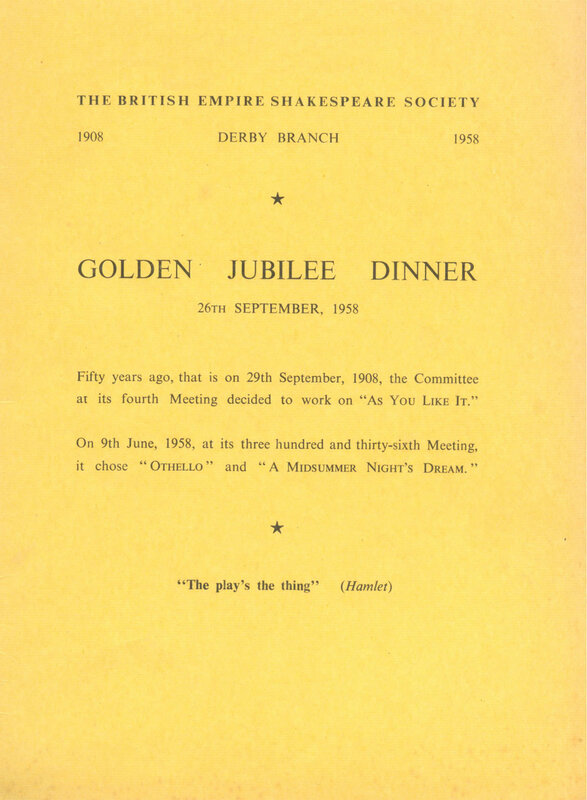 On the 26th of September 1958 our Golden Jubilee was marked by a special celebratory dinner. An anniversary booklet entitled 'What Players Are They?' was written by our Secretary A. A. Dean to commemorate the occasion and tell the story of the society from it's beginnings in 1908. Click the thumbnails above to browse through 'What Players Are They? ', our 50th anniversary booklet. As was the custom at the time, two plays were staged that year as a 'Shakespeare Festival' in back-to-back weeks during February. The plays produced for this momentous year were 'The Merchant Of Venice' & 'Henry V'. We hope to be able to bring you more information and photographs from our 50th anniversary soon.